We have pictures of a few custom made John Deere bedding sets and nursery ideas that will make decorating a baby boy or girl's farm themed nursery room easy! As you will see from the photos; there are many colors and styles to choose from. Another thing that you may notice is that the reference to tractors or the display of the ever popular John Deere logo is very subtle and understated. Fabric covered in tractors can be found if that's what you're looking for but there are just as many selections that have only the tiniest reference to farming equipment. If you can't find a collection that you like simply shop for fabric, buy a few yards and have crib set custom made or even better; buy a pattern and make your own crib set. As you will see in the following nursery pictures, pink John Deere baby bedding for girls is light, bright and very, very cute! 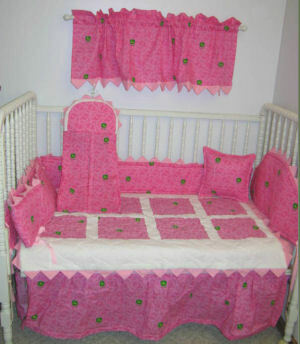 Pink John Deere nursery bedding sets, curtains as well as anything else a mother could ever want to decorate a farm themed nursery for a baby girl is readily available at your local baby boutique. There are several girl nursery pictures in a farming nursery theme in our photo gallery if you would like to take a look. Since farming is a gender neutral operation these days, John Deere baby bedding can be unisex. After all, girls as well as boys are involved in most modern farming operations! 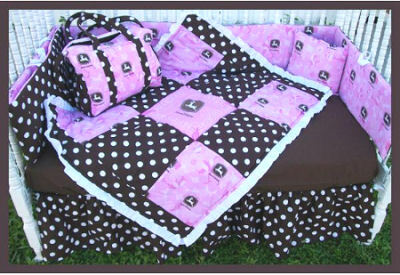 A set of pink John Deere Bedding for girls will go a long way towards making the baby's room more feminine. 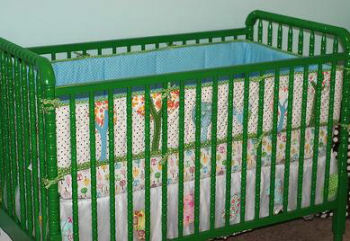 This crib was once a plain, Jenny Lind baby bed with a worn brown wooden finish. With a little hard work and a few cans of green spray paint it was painted in the perfect color for a baby John Deere nursery! If you're getting tired of a classic Old McDonald farm theme bedroom that you've had since your infant was born, give it a makeover with a set of John Deere baby bedding. Even a professional like Old McDonald couldn't have had much of a crop without a good plow and a JD tractor to pull it, so don't worry about the two room themes clashing. A set of baby John Deere bedding can transform an old fashioned farming theme room into a marvel of modern technology in a jiffy. If you come from a farming family, John Deer baby crib bedding is a really cool way to share your agricultural roots with your child. There’s no need to blind yourself with classic green featured in the John Deere bedding cribset while building your nursery themes. Choose the best nursery wall paint color and painting techniques for your room and use it as a foundation or background for the small pops of bright green and barn red you will want to choose. There are many beautiful murals that can be used to decorate the nursery walls and give your John Deere theme a proper setting. 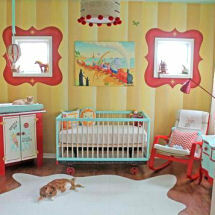 A freshly plowed field with a lovely sunset would be a really easy nursery mural for you to do yourself. If you don’t have the confidence to paint the scenery yourself, you can find numerous artists online that will work with you to copy photographs that you provide. You can get exact replicas of your family’s barn and homestead painted for you to install on a focal wall to compliment your John Deere crib bedding sets to perfection. Once you have your faux farm or barnyard in place, go shopping for some livestock nursery stickers or wallies to give the room a rustic ranch style look. Place a sweet petting zoo near the baby’s crib for baby to enjoy. Plush or stuffed baby farm animals may be the best thing to serve as a background for your John Deere bedding. All kinds of baby farm animals like baby goats, donkeys, calves with some roosters and baby chicks running around the barnyard would be super. A John Deere wall shelf with pegs would be nice or if you don’t have one of these, a plain shelf with a few John Deere caps or hats will pull the theme of your John Deere bedding and accessories around the room. If you are fortunate to have any vintage items or farming antiques in your collection, this is your chance to display them! If you wish, you can skip the John Deere bedding and get a set with farm animals instead! 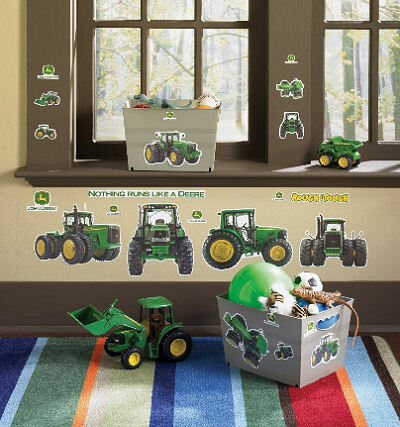 You can still have a tractor themed nursery without an official licensed John Deere bedding set. If this layout is not the look that you’re trying to get there are other stylish treatments that will still work with your John Deere bedding and other farming stuff in the baby’s bedroom. While a John Deere nursery theme may be one of the most popular themes for a baby boy’s nursery, don’t rule it out for your baby girl.